Uden tvivl den til dato bedste bundle. Go go go! 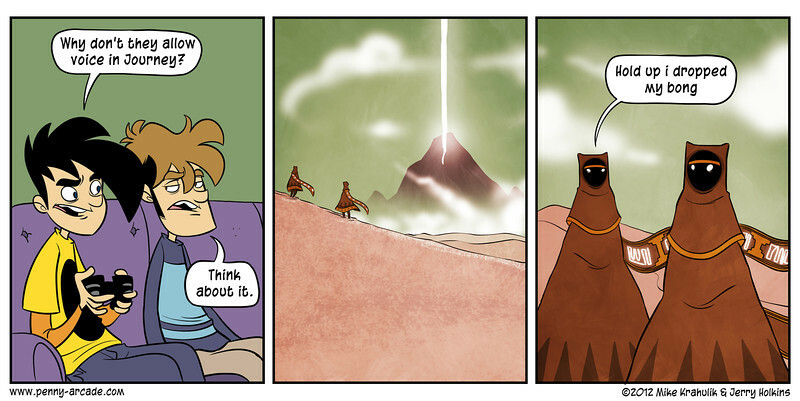 “In Journey, the player takes the role of a robed figure in a desert. The game features no map or instructions, only a large mountain in the distance that the player journeys toward. While traveling the player can encounter other players, one at a time, if they are playing online. Players cannot speak to each other, but can help each other in their journey or not as they wish. Players met online will not be identified with a username and voice or text communication will not be possible with the other player. According to designer, “it’s about two strangers who meet online. They don’t know who they are or how old they are. All they know is, that is another human being.” The only way players can communicate audibly with each other is with a wordless shout. Players will have symbols on the front of their robes for identification, though these symbols change between play-throughs. HTML5 spil fra Mozilla lavet for at vise hvad man kan med browserspil/html5. Koden ligger frit på Github.